Dimensions: 60" x 29" x 30"
Small Nesting Table, Satin Nickel, 24" x 48" x 24"
Large Nesting Table, Satin Nickel, 30" x 60" x 30"
Simple, yet effective, these sturdy display table fixtures are ideal for temporary displays and special sales. Available in 60" length; all are 29" high to top of side walls, 30" deep. Inner surfaces are low pressure white laminate. Folding legs are gloss black enamel. 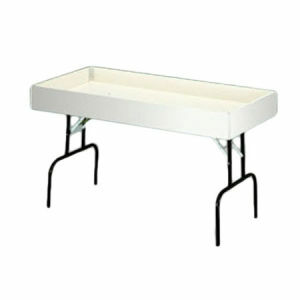 This display table will be shipped VIA common carrier. Freight will be quoted separately. You will be notified of the freight amount.